Eagle is a German exhaust manufacturer that provides a large range of silencers and full systems for motorbikes, and this at a very reasonable price. Often Eagle is the only brand that still make an exhaust or muffler, especially for the older models of bikes. 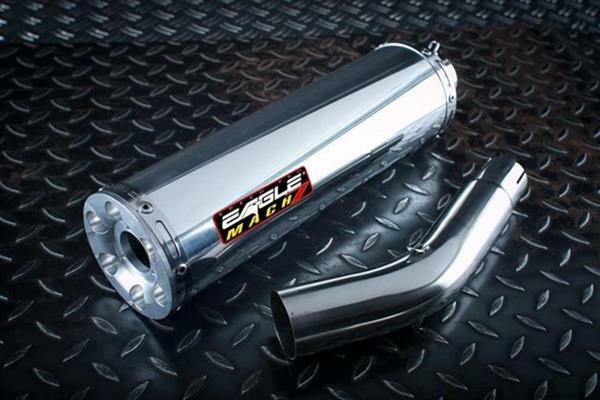 With the Eagle Mach 7 series they make a nice silencer for a price of 249.95 euros, link pipe, DB killer, e-approved and mounting hardware included. The entire range of Eagle can be found in our webshop, and this in the section of motorbike exhaust and maxi-scooter exhaust. The Eagle M7 muffler can optionally be assembled in different colors and lengths. From the same manufacturer are also the Raptor and Cobra brands that are not online at our site yet. Through the two links of the brands you can choose your exhaust and send us an email to order this.